Chelsea Green Publishing Company, 9781603582506, 224pp. 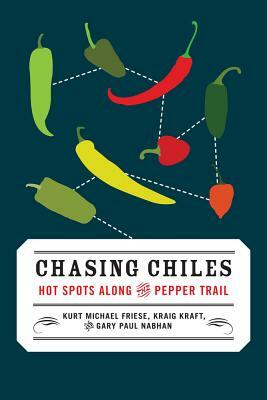 Over a year-long journey, three pepper-loving gastronauts-an agroecologist, a chef, and an ethnobotanist-set out to find the real stories of America's rarest heirloom chile varieties, and learn about the changing climate from farmers and other people who live by the pepper, and who, lately, have been adapting to shifting growing conditions and weather patterns. They put a face on an issue that has been made far too abstract for our own good. Chasing Chiles is not your archetypal book about climate change, with facts and computer models delivered by a distant narrator. On the contrary, these three dedicated chileheads look and listen, sit down to eat, and get stories and recipes from on the ground-in farmers' fields, local cafes, and the desert-scrub hillsides across North America. From the Sonoran Desert to Santa Fe and St. Augustine (the two oldest cities in the U.S.), from the marshes of Avery Island in Cajun Louisiana to the thin limestone soils of the Yucatan, this book looks at how and why climate change will continue to affect our palates and our producers, and how it already has. Gary Paul Nabhan is an award-winning author, plant conservationist, and sustainable-agriculture advocate. His collaborative work in agricultural conservation has been honored with Lifetime Achievement Awards from the Quivira Coalition and the Society for Conservation Biology, and with the Vavilov Medal. Widely acknowledged as a pioneer in the local-food movement and grassroots seed conservation, Nabhan was honored by Utne Reader in 2011 as one of twelve people making the world a better place to live. A recipient of a MacArthur Genius Award, his twenty-four books have been translated into six languages. He raises rare chile peppers and Mission-era orchard crops in Patagonia, Arizona. Kraig Kraft is an agroecologist and writer based in Managua, Nicaragua. He completed his PhD on the origins and diversity of wild and domesticated chile peppers at the University of California, Davis. Kraft is the author of a popular blog titled Chasing Chiles, and has written for several regional magazines, including Edible Sacramento, as well as technical journals, and is currently working on a coffee sustainability project in Central America. Chef Kurt Michael Friese is author of A Cook's Journey: Slow Food in the Heartland (Ice Cube, 2008), and owner and founding chef of Devotay, a restaurant in Iowa City that is a community leader in local and sustainable cuisine. He is owner and publisher of Edible Iowa River Valley magazine, a board of directors member for Slow Food USA, and a graduate and former chef-instructor at the New England Culinary Institute.